As this newsletter is released, the albertapatients community is 6,100 members strong and still growing. You are now, I believe, the largest online community dedicated to health care in the province and possibly in Canada. Word is spreading that you are a group of people who have important opinions in the health care system. In recent months we have partnered with the Alberta government, the Health Quality Council of Alberta and Alberta Health Services to gather information about initiatives they are exploring that will affect you. You may recall the survey on sharing of patient health information in an integrated health information system. We shared out a survey from Alberta Health regarding virtual care by which you might interact with your physician online. In the last few weeks, we fielded a survey that is part of a PhD candidate’s research project. She is studying why and how patients engage with large health care systems and organizations and hoping to identify better ways of doing this so that the patient’s voice can be heard in more venues. That research will be widely shared across Alberta when complete (and we’ll bring you back some results, too). In this newsletter you’ll see the data from our second tracker survey about the patient experience in primary care. The results are being shared with the Alberta Medical Association’s Section of General Practice. Finally, the AMA Board of Directors continues to be updated on what’s happening in albertapatients. You’ve assisted us with important questions in the past two years. In the near future we’ll be coming to you with some questions about work that physicians are leading to improve access and quality in the system so that you can help us assess what patients value. Thanks for all you do. Please spread the word! 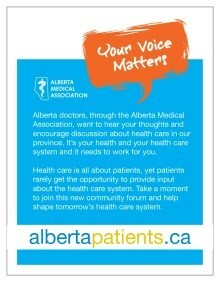 In March, we asked albertapatients members about their recent experiences with health care providers in Alberta. We periodically ask these questions to track health care system performance over time. Please read on to the Did You Know section (below) for highlights from that research and a link to the full report. 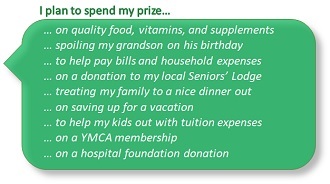 Recent patient experiences with health care providers. The average visit with a doctor lasts around 15 minutes. 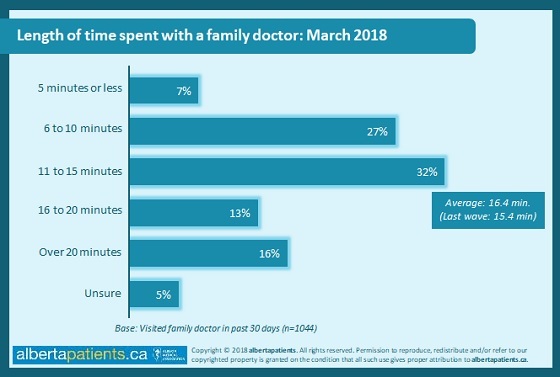 Based on their last visit, patients reported spending an average of 16 minutes with a family physician. This is fairly consistent with the last time we asked this question in September 2017 (average visit length: 15 minutes). Patients generally feel that doctors are doing a good job when it comes to hearing concerns and making recommendations, but would like to see more emphasis on understanding an individual's health history and preventing illness. 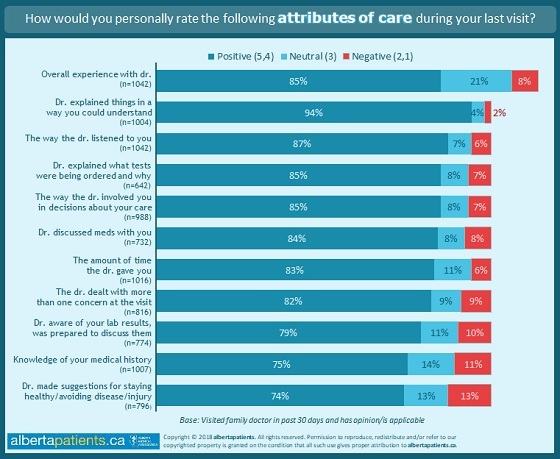 Patients were asked to rate their satisfaction with different attributes of care they may have experienced during their last visit with a doctor. Top marks were given to attributes related to interacting with patients (e.g., listening, explaining, involving the patient in decisions) but there is room to improve when it comes to more technical details (e.g., discussing lab results and medical history) and offering suggestions on ways to stay healthy/prevent illness. Feeling heard and being involved are the two strongest drivers of overall patient satisfaction. We also looked at correlations between the individual attributes of care and patient overall satisfaction. 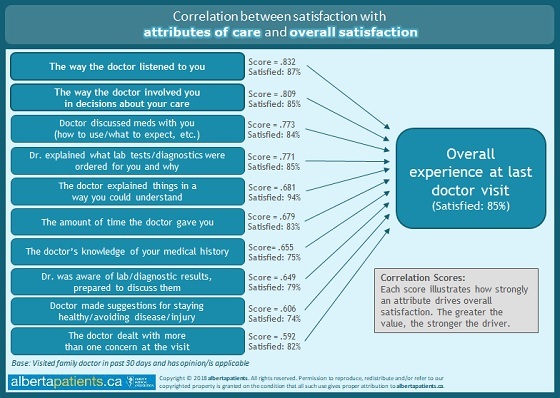 The survey data suggest that the two strongest drivers of overall satisfaction with a medical visit are how well the doctor listens and involves the patient in care decisions.